One of the most depressing outcomes of the Los Angeles primary elections in March was that only roughly 10 percent of registered voters participated. But a group of LA Unified students connected with the United Way Student Leadership Program took the news to heart and decided to do something about it. Over the course of two weeks, students from 37 campuses around the district registered over 2,700 students who are 18 or older and eligible to vote. The effort, which ended on Friday, was sponsored by the LA County registrar’s office, Assembly Member Jimmy Gomez and California Secretary of State Alex Padilla. Mooney said this is the first time the organization has undertaken a student voter registration drive. The seeds for the idea were planted in the March primary campaigns when the United Way hosted several candidate forums and enlisted students to volunteer at the events. “They were very inspired by the whole process, and then the kids found out that less than 10 percent voted, and they were pretty dismayed by that. The kids were upset and angered, but wanted to do something about it,” Mooney said. Another key factor was a Los Angeles Times column by Steve Lopez that featured three of the student volunteers. “The secretary of state reached out and said he saw the Steve Lopez piece, and said, ‘How can I help?’ That helped spur the effort,” Mooney said. 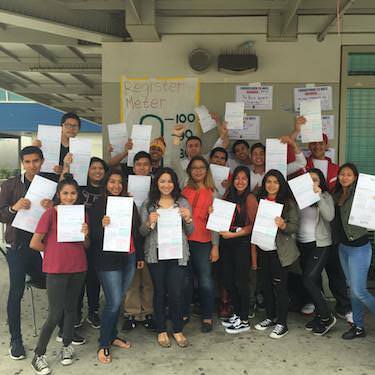 The registration drive — chronicled on the Twitter account @LAYouthVote — featured students trained by the registrar’s office registering other students. “All you have to do is give the students the tools and some buttons and they really just ran with the whole thing,” said Mooney, adding that the United Way is planing similar student voter registration events for future elections. The drive took place at campuses all over the district, including Carson High, Torres High, North Hollywood High and Eagle Rock High.